la Closerie des Lilas | Mystère et boules de gomme ! 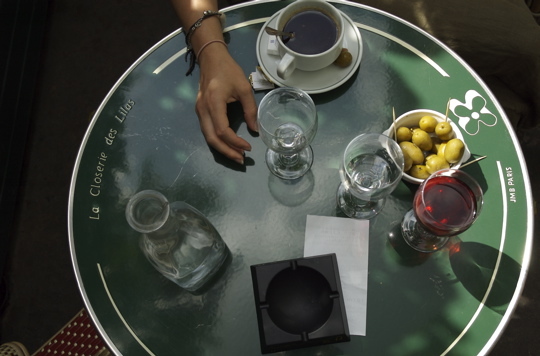 F. Scott Fitzgerald, Ernest Hemingway, Henry Miller, Amedio Modigliani, Pablo Picasso, Jean-Paul Sartre, Gertrude Stein…the list goes on and on of giants of the arts and letters who, when in Paris, sought out the peaceful setting of la Closerie des Lilas for their preferred beverage, a bite to eat, and inspiration. 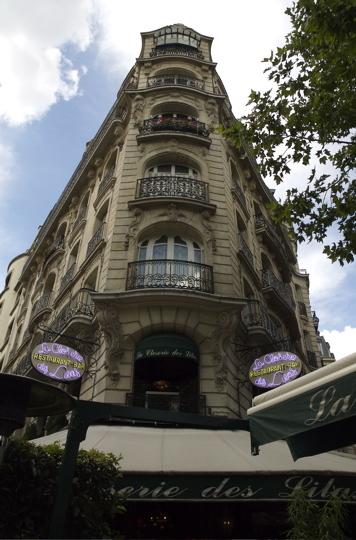 But for us FIA fans, two names eclipse all these others when we think of the la Closerie: Robert Taylor and Mireille Belleau. 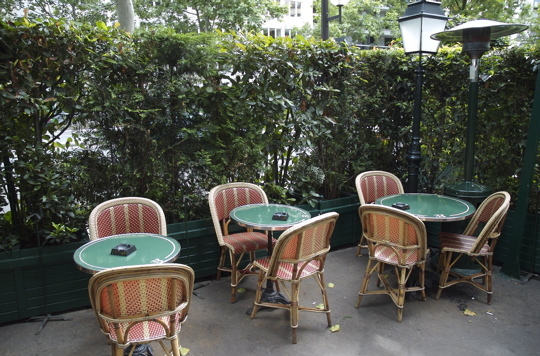 It was at this hallowed spot that Robert and Mireille spent leçons 19–21 in animated conversation. It was here in Leçon 20 that Robert becomes a bit dérangé by Mireille’s rapturous description of her prof d’art grec…et paf, over goes his kir onto her skirt. 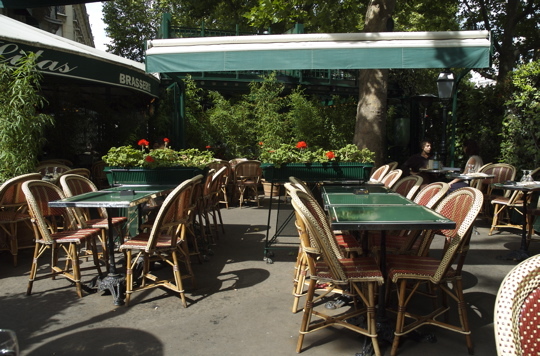 One morning last summer, my wife and I headed here for a rest after our perambulations through the Jardin du Lux. We hoped it would look as it had in FIA and we weren’t disappointed. I’ve always enjoyed the character of the serveur in these episodes, played by Olivier Lebeau, who waxes rhapsodic about the talent of Hemingway before admitting he’s never read any of his books. Non, Mademoiselle, je n’ai pas le temps. Vous savez que c’est…le travail, la famille, le jardin. Je ne connais pas son oeuvre, mais j’ai entendu parler. Il paraît qu’il buvait beaucoup…mais c’était un écrivain de génie! Lebeau really captures the demeanor of the French waiter. There is an IMDb page for Lebeau with a number of French film and TV credits, but nothing more recent than 1992. Our waiter didn’t look much like him, but he was professional and courteous as one would expect. 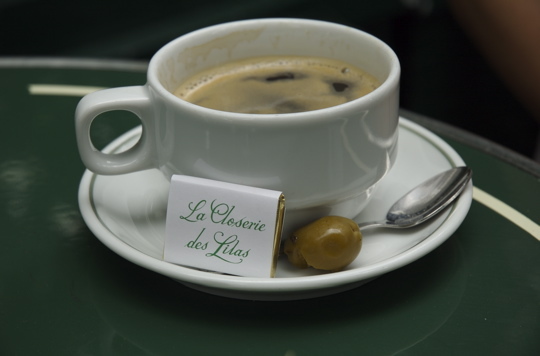 Just as for Mireille, la Closerie was un peu trop chic et trop cher for the likes of us, and so my wife ordered only a coffee and I..well of course I had to order a kir! No accidents occurred, however, and our waiter didn’t need to se précipite towards her with a towel. Here are some snapshots I took of the lovely outdoor dining area that seems virtually unchanged from FIA. How strange that you can find so many names on brass plaques throughout the interior and yet the names Robert and Mireille appear nowhere, and neither do the names of the talented actors who gave life to these characters, Charles Mayer and Valérie Allain! I am going to offer a little tip to the management of the Closerie (sooner or later grâce à Google one of them is bound to read this free publicity for their restaurant). You need to (1) embed a commemorative plaque of some sort in the pavement at the spot where Robert and Mireille sat, and (2) you should name your kir « le kir Mireille. » Amongst all the autographs reproduced on your paper placemat, why not include those of Charles Mayer and Valérie Allain? And while you’re at it, why not turn the now useless phone booth into a FIA shrine? The Closerie sequence is my favorite. We enjoyed a delicious meal at the Closerie in July, after walking down through the Luxembourg Gardens and the Parc de l’Observatoire past the Marco Polo fountain. My wife ordered the Quenelles de Poisson avec Sauce Nantua. SO good. I found the recipe in Julia Child’s book and made it back here in the states — to pretty strong acclaim! Yum. Great photos!! Thanks for this entry. 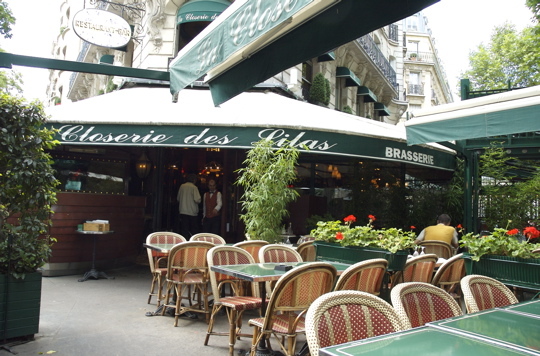 I love the episodes filmed at the Closerie. 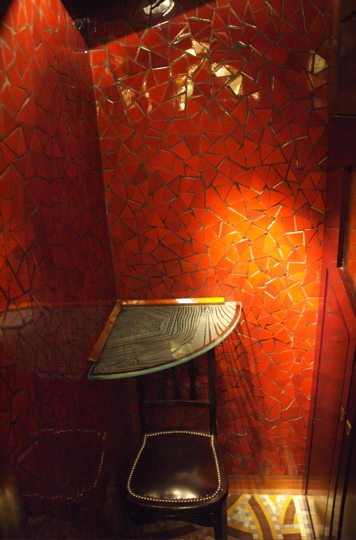 Thanks for showing us the terrace and even the phone booth (sans phone). I agree, they do need to have a plaque… somewhere out on the terrace maybe….to commerate the Robert and Mireille episodes. You’ve inspired me to watch them again. 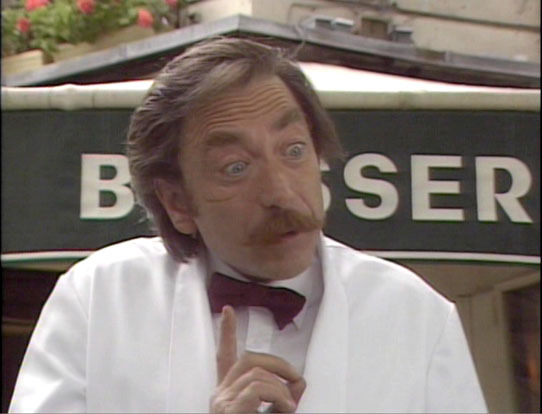 « Brasserie », that’s a practical joke.